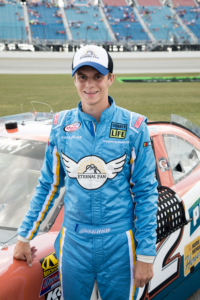 NASCAR driver Joey Gase to join the Eternal Fan™ promotion team as the Official Racing Spokesperson of Fan Memories™. This opportunity allows Gase to share Fan Memories™ at America’s beloved racing venues as he continues his own pursuits in racing. Gase and Eternal Fan™ first teamed up together last season on various appearances in both the Monster Energy NASCAR Cup Series and the NASCAR XFINITY Series. The partnership matured quickly and is now set to show the racing industry how powerful a Fan Memories program can be for iconic sports venues. Gase’s personal dedication to increasing awareness of organ, eye, and tissue donation and honoring all of those affected by it first led Eternal Fan™ to the realization that he would be an ideal person to lead the Fan Memories™ program. The inaugural program of Fan Memories™ was just announced by Richmond Raceway in Richmond, VA. In this partnership, Eternal Fan™ works with Fans to provide a better way of expanding the great relationships Fans already have with Richmond Raceway. The first Fan Memories™ program was custom built for Richmond and features a 21-foot Eternal Fan™ “World’s Largest Piston” as well as new areas specifically designed at the raceway to display Fan Memories™ Plaques. These special features, and many more, will serve as a way for Fans to enshrine their most beloved memories at Richmond Raceway for years to come. New individual Fan Memories™ programs implemented across an ever-growing set of sports venues will each be custom designed to meet the needs of that specific venue and its most passionate Fans. Eternal Fan™ was created to provide a better way for Fans to celebrate the passion that they have for sports and the places where they experienced positive shared memories. Eternal Fan™ is transforming traditions by creating a legacy for people to celebrate their sporting lives for generations to come. Fan Memories™ programs are custom-designed for each venue to continue the relationships with their avid fans. Their most passionate enthusiasts can preserve their favorite memories for generations to come. Fan Memories™ is powered by Eternal Fan™, who in turn works with the venue to create many innovative opportunities for Fan engagement. These enhanced, customized interactions are designed to deepen connections with sports venues and create perpetual Fan loyalty.